The Incoming section continues to provide a comprehensive list of interesting forthcoming DVD releases. It's constantly being updated with newly-announced titles, so please visit it regularly! Don't forget, you can also get a list of recently released titles, culled from Incoming database, here. 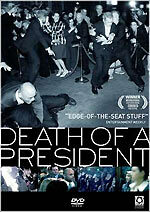 The controversial documentary Death of a President, which recently aired on More 4, will be released by Optimum on DVD on October the 30th. The documentary, which speculates what might happen if George W. Bush was assassinated, will be supported by a commentary track (by director / producer / writer Gabriel Range, writer / producer Simon Finch, Editor Brand Thumim and line producer Donall McCusker); interviews with the filmmakers; and a theatrical trailer. The RRP is £15.99. The second series of Aussie sitcom Kath and Kim will be released on DVD on November the 27th, by Contender Home Entertainment. Some etailers are listing bonus bloopers, and other features, but these were not mentioned by the press release. The RRP is £19.99. A box set, containing the first and second seasons, will also be released that day, with an RRP of £29.99. Pathé Distribution will release the tense thriller Adrift on DVD on December the 26th. The film, about a young couple who are accidentally abandoned in - ahem - open water. No technical details were announced. Nor were there any details about any bonus features. Oh, and there's no sleeve available yet. The RRP might be £15.99.